This is an easy to make sausage that will impress your fat-fearing friends! Beacuse this sausage is so lean, it may be a little on the dry side. However, sliced thinly and stacked on a sandwich with a bit of mustard and mayo it tastes wonderful and will blow away any competition from the supermarket deli. Ice cold water, up to 100ml. 1. Trim loin of connective tissue and silver skin. Cut loin into 3-4cm cubes. Mix with 90% of salt and cure #1. Cube beef and mix with remaining 10% of salt and cure #1. Pack tightly in separate containers, cover and keep in refrigerator for 48 hours. 2. Grind beef twice through 3mm plate. 3. Mix the twice ground beef adding 25-30% (30 ml), cold water, spices and garlic. Mix until very very sticky. 4. Run the cubed loin through the kidney plate (without the knife) of your grinder. This willbeat beat up the cured chunks and help in extracting the myosin. Mix until sticky and then combine with the beef and spice batter, mixing well. Add the rest of the water gradually, blending until completely absorbed. 5. Stuff firmly into 55-65 mm synthetic casings. 6. Hang for 2 hours at room temperature to set the sausage and dry the casing. 7. Smoke for 2-3 hours at 55-60°C. Smoking for a longer period may make it too dry. 8. Poach sausages in 80°C water until an internal temp of 70°C is reached. This should take about 30 minutes. Shower or immerse in cold water to cool. 9. Hang at room temp to dry and bloom the product then refrigerate. That looks good. I'll have to try that because I don't think it would last long around the house. If I were to serve several of my products on a plate, this one would probably lose if the tasters were blindfolded. But by looking at it and eating it, many would choose it as their favourite because it looks and is so lean. Even though it's now been proven that animal fats are not detrimental to your health, people still have a fear of the white stuff. I gave one of the sausages to a friend and she was overjoyed when I told her it was a "diet sausage". redzed wrote: If I were to serve several of my products on a plate, this one would probably lose if the tasters were blindfolded. But by looking at it and eating it, many would choose it as their favourite because it looks and is so lean. Even though it's now been proven that animal fats are not detrimental to your health, people still have a fear of the white stuff. I gave one of the sausages to a friend and she was overjoyed when I told her it was a "diet sausage". I tell some that my stuff is "beyond organic". That seems to help. Looks great though. We eat a lot of sliced ham so I've got to put this on my list of things to do. Another nice looking sausage, redzed! I am sure it tastes great and it's easy to make... Do you think 12 mm plate will work for this sausage or kidney plate works only? Thank you! No the 12mm plate will not work if you want to make the same sausage, because it is composed of cut, not ground loin. The kidney plate is used without the blade so there is no grinding. The grinder auger helps to extract the myosin proteins that aid in the bind. If you don't have a kidney plate you could take a potato masher and press mix the cured chunks. On the other hand, if you grind the loin with a 12mm plate, combine with the finely ground beef and follow the rest of the instructions you should still end up with a tasty sausage. redzed wrote: On the other hand, if you grind the loin with a 12mm plate, combine with the finely ground beef and follow the rest of the instructions you should still end up with a tasty sausage. This sounds interesting and I will definitely experiment with this in my nearest future. On the other hand, I have 6 or 7 plates in my arsenal so adding one more (kidney) won't hurt at all. Thank you, redzed! For those without a kidney plate there are other options. Like redzed stated above mixing with a potato masher or even by hand will help extract the proteins. A stand mixer (like a Kitchenaid) is another option which does an excellent job. 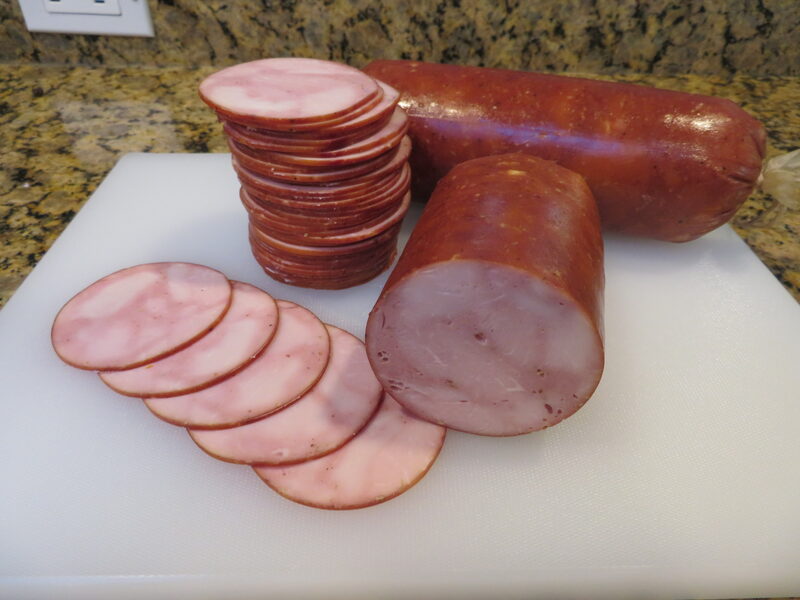 If you scroll down in this thread to StefanS's post on Ham Kielbasa he demonstrated with pictures how to use a meat mixer to make a similar chunk sausage.